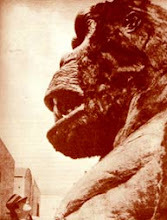 Chris Walas's Build-Up Gorilla Bash !!!.. Part 9...Time to face...Da Feet ! 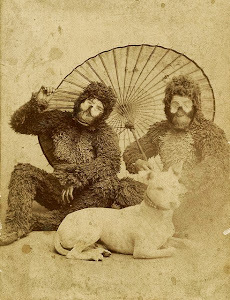 Holy Ape suit Gorilla Gang ! 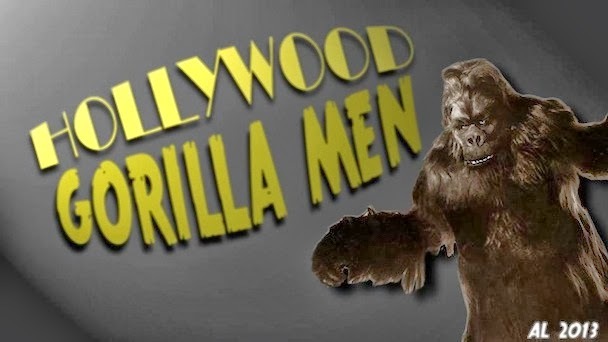 If you've been following along thus far, Academy Award Winning, Special Effects Make-up Artist Chris Walas has taken us through a step by step process of constructing a build-up gorilla suit. With the head, Hands, and lower Arms out of the way, it only makes sense to take the next steps into some gorilla feet ! Now, without further ado...Mr. Chris Walas !!! The feet are pretty straightforward and if you are attempting to try this yourself, you should be at a point that you feel fairly comfortable with the build-up technique by now. I won't be adding much detail of the bottoms of the the feet as I really want the base of the shoe to be hitting the floor, not a layer of foam padding. I start with a rough outline of where I want to go with the feet. Normally, a gorilla stands and walks with his/her "thumb toe" straight out, or perpendicular to the side of the foot. This gets a bit clunky when wearing big rubber feet so I'm making the concession of angling the toe in a bit. I trimmed this out and made sure it roughly fit around the front of the shoe. I'm doing both feet at the same time, largely because I'm in a rush to get these done to clear space for other projects! But also to keep better tabs on matching them. Both sets of toes are formed to the same level of finish. 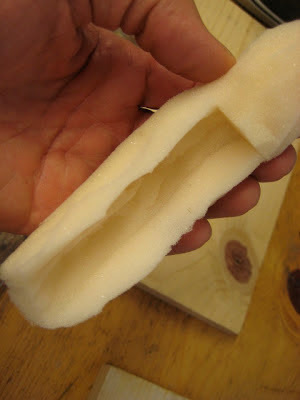 Once they are glued on, I add a piece of 1/2" foam to fill in the top of the foot. Here's what they look like from the bottom, I've already added a coat of contact cement to the sole of the shoe so that the next coat will adhere even better. On to the batting. I'm trying to cover as much as possible on the bottom in one piece. This is to keep it even. Lumps in the batting will be felt when wearing the feet, so I'm working from the bottom tot the top. For the sake of speed, I'm covering the entire foot with batting so I can speed up the latexing. Most of this will actually disappear under subsequent layers of latex. Feet get a lot of wear and abuse , so it's going to take a number of coats of latex to get these soles thick enough. The top will take a bit more detail and I'll be adding toenails later. Once the feet are dry. I simply use some batting to form cuticles for the nails. Once they've been latexed and dried, I add some batting cut to shape for the nails. I used a spatula to apply and smooth the latex for the nails, then drew in a crack or two. I've been adding many layers of latex to the bottoms all along and now it's time to do the furring. I like to use two overlapping pieces of fur on feet like this. The first piece covers the back of the foot. While the second, larger piece covers the front half of the foot and overlaps (but is not glued to) the back section of fur. SO… now we have a head, a pair of unpainted hands/forearms and a pair of unpainted feet for this gorilla. So much for the easy stuff. While doing the mouth is the most demanding in many ways, the main body of the suit is certainly the most cumbersome and awkward to do. So that's what we'll do… next time. Chris Walas's Build-Up Gorilla Bash !!! Part 8...Fearsome Forearms !!! OK gang, Lets rejoin Chris Walas in putting together some massive monkey forearms ! So we have the hands done and now all we need to do is attach them securely to the forearms. The forearm foam form is a simple tube. I've done detailed, muscled forearms and the detail was completely lost once furred, so a simple tube will do. The tube should be a good, snug fit so that it holds firm even when you're covered in sweat. I would give you measurements for this, but yours will almost certainly be different. Just put one of the gloves on and measure the distance from the base of the hand to the very end of your elbow. 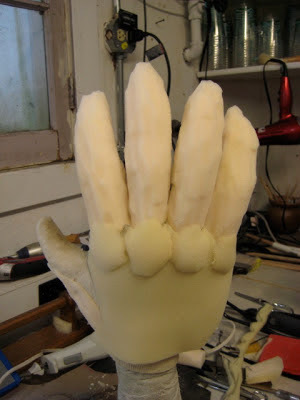 Now glue the base of the glove to the inside of the tube and glue the bottom of the hand foam to the top of the foam tube. After that, I do the batting/latex down over the joint between hand and wrist. This adds a little more strength to the joint. I'm using two cheap suits to build one slightly less cheap suit here. Not surprisingly, the arms of the suits are too small in diameter to work so I'm forced to use a section of the legs of one of the suits. (I'm going to be so upset if I run out of cheap suit!!). I marked the pattern on the fur piece in chalk first. I'm going to be gluing the underside of the forearm first so that the very last bit of the top section overlaps the lower section for a more natural look. I'm also allowing a good inch or two of extra fur at the bottom so that the fur can be tucked and glued over the elbow edge and into the tube to help disguise the joint. I won't be doing this , though, until I have the suit together, just in case I need to make any emergency changes. You'll notice in the photo below that I also trimmed the bottom of the tube to round it off. I'm using an industrial grade spray adhesive for the larger areas of fur, but I like to glue down all the edges with a strong contact adhesive. Next we'll move on to the feet and hopefully get a start on the main suit itself! Labels: Chris Walas, Chris Walas's Build-Up Gorilla Bash......Part 8..., Fearsome Forearms ! 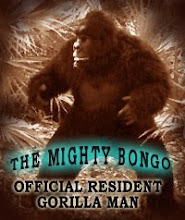 Chris Walas's Build-Up Gorilla Bash......Part 7...A change of mood ! 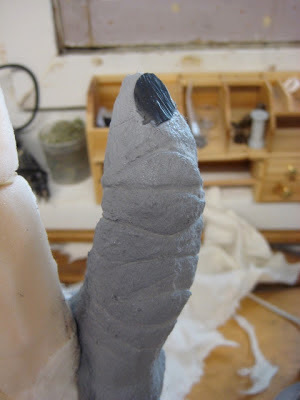 I think of build-up techniques as the finger painting of monster making. Just as in finger painting you can smooth colors around, add more paint, scoop some off, etc., build-up allows you to do a very high degree of reworking. Now the face that I had done was just fine for the character and there was really no need to redo any of it… however, Drying latex on the hands gave me "waiting" time. I get terribly impatient waiting and so I decided to play a little more with the face on Mogo. It started when I decide to trim down the hair on the top of the head like a lowland gorilla. I found that I had a big empty spot over the brow. Well, I decide the make the brow stand out a little more by sinking the area just above it, so out came a section of latex and foam. Once I had reworked the top of the brow, it was too late. I was having too much fun so I decided to make some other changes. I chose to sink the entire eye area and bridge of the nose and to add a little more to the center bottom of the brow, again to add a little more menace. So I just hacked out a whole area. A bit of foam under the brow and it was onto the batting. I think the changes help and the folds under the eye are a little more balanced and natural. It may not be that much of a difference, but I think it helps and it kept me busy while I was waiting. As you can see, Mogo now looks extremely angry. Take note of the more realistic folds under the eyes also. Compare to the mask, from two installments before. Mogo was still angry, but not nearly as grumpy as he above. Up next, Chris will tackle Mogo's monstrously muscle-y forearms !